Civil disobedience gets results, and there are many examples throughout history of noble acts of civil disobedience. Whether these results are morally justified in a democracy “of the people” and “for the people” is debatable. The two cases presented in Red Book will attempt to set the stage for you. The author of this case preempts the assumed negative position by choosing to value “national interest” for the weighing mechanism for the affirmative side. This affirmative position will argue that in order to protest unjust wars where no political party in the democracy will object, truly patriotic people will use civil disobedience to protest the war. 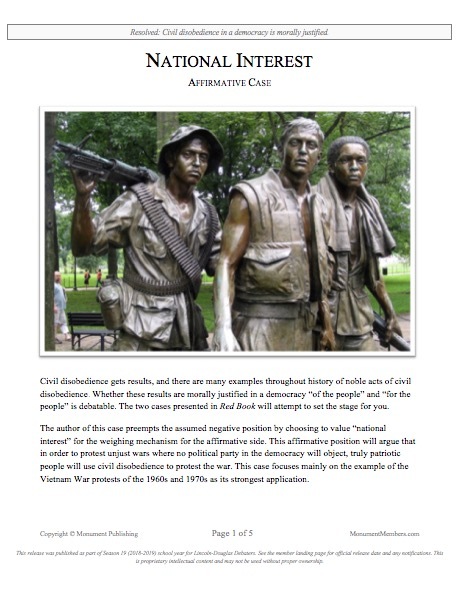 This case focuses mainly on the example of the Vietnam War protests of the 1960s and 1970s as its strongest application.